Gail Rubin and Death Cafe mascot Lola in Fairview Cemetery, Albuquerque. As human beings we really don’t like to talk about how our lives will end, which is why fewer than 30 percent of people do any end-of-life planning. But a new festival launching in October in Albuquerque will offer a variety of practical and fun activities designed to encourage people to plan on their terms how they want the end of their lives to look like. The Before I Die Festival takes place Oct. 20-25 and is the first of its kind West of the Mississippi. It will include film screenings, panels of experts, dinners and death cafes, and even yoga (from child’s pose to corpse pose). 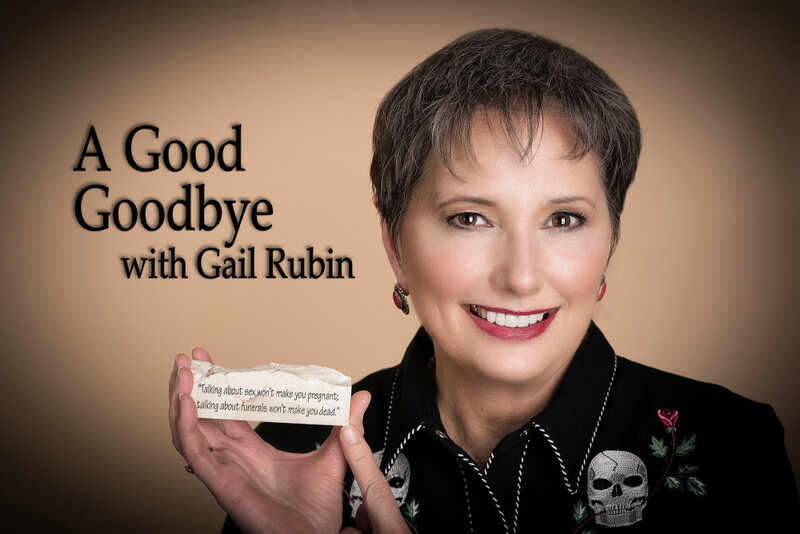 Megan Kamerick talks with festival organizer Gail Rubin, the Doyenne of Death, who has made it her mission in life to help people think about death in a healthy, engaged and fun way. ALBUQUERQUE, NM (KRQE) – Steve Borbis, 71, isn’t afraid to talk about dying. Death is often considered a taboo topic, whether out of fear or to protect the feelings of loved ones. “There are the ideas that, ‘If I talk about it, it’s going to happen,’” said Gail Rubin of Albuquerque. However, at the Death Cafe, where a conversation about death over tea and cake is encouraged, there is more laughter than tears. The lighthearted conversation – usually discussing people’s philosophical ideas about what happens after death and their own out-of-body experiences – is why Rubin, the self-proclaimed “Doyenne of Death,” is spearheading the local Death Cafe movement. Rubin hosts monthly meetings to get the conversation started in addition to her work with companies “to connect with baby boomers concerned about end-of-life issues,” according to her biography. “If you go out the door and don’t come back, your loved ones are going to be left with a huge mess to deal with,” Rubin said, adding about 30 percent of people don’t do any end-of-life planning. And on The Archbishop’s Hour on Catholic Radio, host Mary Woods interviewed Gail along with Augustine Villegas and Kim Montoya-Hopkins with the Catholic Cemetery Association live on Friday, October 13. They discussed a new guide about funeral planning for Catholics, green burial, cremation issues, and the upcoming Before I Die ABQ Festival. The interview will be rebroadcast on Immaculate Heart Radio, 98.9 FM at 8:00 p.m.
« Vote for Your Favorite Fun Funeral Film!